Venice Renaissance Painter, Founder of Venetian School of Painting. of the great Renaissance portraits. Sts Peter, Catherine, Lucia & Jerome. Church of San Zaccaria, Venice. One of the greatest, most influential Old Masters of Renaissance art, Giovanni Bellini was a major influence on Venetian painting and on the transformation of Venice from a minor artistic centre to a powerhouse of the Italian Renaissance rivalling Florence and Rome in importance. In particular, he established a distinct school of High Renaissance painting, based on a more sumptuous, colouristic style. By employing clear, slow-drying oil paints, he was able to create deep, sensuous tints, tones and detailed shadings, and thus produce outstanding religious paintings and portraits, as well as wonderful atmospheric landscapes. The best painter of the Renaissance in Venice, his methods had a great impact on his contemporaries and pupils, such as Giorgione (1477-1510), Sebastiano del Piombo (1485-1547) and Titian (c.1485/8-1576). In addition to this, he created some of the best drawings of the Renaissance. Famous paintings by Giovanni Belli include: Transfiguration of Christ (c.1480, Museo di Capodimonte, Naples); Portrait of Jorg Fugger (1474, Galleria Palatina, Palazzo Pitti, Florence); Ecstasy of St. Francis (c.1480, Frick Collection, New York); Sacred Allegory (c.1490, Uffizi Gallery, Florence); Portrait of Doge Leonardo Loredan (1501, National Gallery, London); the San Zaccaria Altarpiece (1505, Venice); and Madonna of the Meadow (1510, National Gallery, London). Giovanni Bellini was born in Venice into a family of Early Renaissance artists - his father was Jacopo Bellini (c.1400-1470), his brother was Gentile Bellini (1429-1507), and his brother-in-law was Andrea Mantegna (1430-1506). Like his brother Gentile, he learned drawing and painting, as well as the rudiments of oils, in his father's workshop. His early works - mostly religious art - were generally panel paintings executed in a rather stiff Byzantine style, using tempera, and conveyed a degree of religious intensity. During this early period in Giovanni Bellini's life, the greatest influence on his painting was his brother-in-law, Andrea Mantegna. Bellini's Crucifixion (1455) in the Correr Museum in Venice, demonstrates how well he had absorbed Mantegna's lessons, notably in the foreshortening of Christ's body and the treatment of the rocks on which the Cross is planted. At the same time Giovanni's own artistic personality emerges strongly in the way that the drama of the Crucifixion is humanized by its setting, with Christ's body shown against a river landscape in the light of dawn. In the famous Pieta (1460, Pinacoteca di Brera Milan) Mantegna's smooth marble is converted by Bellini into suffering flesh. The Pieta foreshadows the masterpiece of the decade 1460-70, the Polyptych of St Vincent Ferrer (1464, Venice, Church of SS. Giovanni and Paolo). The painting is notable for its use of light, which glows from the top to bottom of the figures of the saints, outlining them with an incisiveness and energy that recall some aspects of the work of Andrea del Castagno (c.1420-57). The figure of St Christopher is set in a landscape with the sun low on the horizon, against the setting sun, the river banks are reflected, in perspective, like the sky, in the transparent water of the river. It is this passion for man and nature that separates Bellini from Mantegna, from whom he took his use of space but not his brother-in-law's schematization and concern for architectural detail. Bellini was himself drawn instead towards the work of Piero della Francesca (1420-92), in which the laws of perspective were put at the service of exalted ends. Piero's influence can be plainly seen in the Coronation of the Virgin (Pesaro Museum) which some authorities date around 1473 and others between 1470 and 1471. Space is no longer divided up, as it is in the polyptychs of the period, instead, unified by linear perspective, it draws together in a new way the buildings, the figures, the throne and the landscape. A knowledge of the works of Piero della Francesca was obviously essential to this maturing of Giovanni's art and, like the arrival of Antonello da Messini in Venice in 1475 (see below), it was decisive for the future course of Venetian painting. It was the conjunction of these two circumstances that, around 1475, brought the Early Renaissance to Venice and led to the original work of the last quarter of the century - see, for instance, works by Carpaccio (1460-1525/6), Cima di Conegliano (1460-1517/8) and Bartolomeo Montagna (1450-1523). Note: For details of drawings by Renaissance artists in Venice, see: Venetian Drawing (c.1500-1600). For most of his painting career, Giovanni Bellini concentrated on religious works of art (fresco murals and altarpiece art), except for occasional examples of portrait art, like his famous Portrait of Doge Leonardo Loredan (1501). In 1470, he was appointed along with his brother and other artists to produce a cycle of decorative paintings for the Scuola di San Marco. This was followed by a series of great historical fresco paintings for the Chamber of the Grand Council in the Doge's Palace. Unfortunately, there are no surviving works from the Scuola di San Marco, and all Giovanni's (and Gentile's) mural painting in the ducal palace were destroyed in the catastrophic fire of 1577. 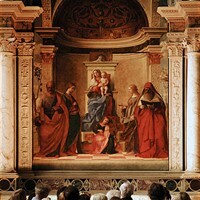 Giovanni's still more famous tempera altarpiece in the church of S. Giovanni e Paolo was destroyed, along with Titian's Peter Martyr and Tintoretto's Crucifixion, in a fire in 1867. For more about Giovanni Bellini's talent for religious painting, see: Venetian altarpieces (c.1500-1600). Giovanni Bellini was one of the first Venetian painters to devote himself to the medium of oil painting. After 1475, he forsook tempera and painted almost exclusively in oils, a medium in which he rapidly became a consummate master, in a similar class to the Florentine Leonardo Da Vinci. The likely reason for this fascination with oils was the visit of the Sicilian artist Antonello da Messina (c.1430-1479), who arrived in Venice in 1475-6, having absorbed the latest oil painting techniques in Naples, a city dominated artistically by the school of Flemish painting and by the Netherlandish Renaissance. His paintings combined Italian skill in anatomy and composition, with Dutch realism, and glowed with a rich intensity. Giovanni Bellini's genius enabled him to transfer these attributes to his new works, while giving his figures an expression of peaceful contemplation. As one Bellini expert has said: "Some artists invented more but none perfected so much." In addition, he continued to innovate and keep up to date, borrowing and then harmonizing ideas from his pupils and contemporaries. In any event, Antonello da Messina's visit galvanized Bellini, whose oil paintings began to exude a new luminosity and richness. (For more, see: Venetian Portrait Painting 1400-1600.) Subtle tonal variation becomes more evident and a new atmospheric quality enters his work. For example, his wonderful background landscape painting, as seen in many of his pictures of the Madonna, make him the most important Italian landscape painter of the Early Renaisance. These lovingly explored landscape backgrounds of Giovanni, dominated by deep greens and by skies which, clear at dawn, become lightly tinged at sunset, are less systematic in their classicism than those of Mantegna. The spectator will discover in them feelings that have nothing to do with Mantegna's restricted world. Thus, in The Agony in the Garden (c.1460, National Gallery, London), which is derived from Mantegna's painting on the same subject (1457, Tours Museum), Bellini brings the landscape to live by his lively feeling for colour and light, while retaining the geological structure inspired by Mantegna. The Resurrection of Christ (Staatliche Museen, Berlin) can be dated around 1480, as can St. Jerome Reading in the Countryside (National Gallery, London) and St Francis in Ecstasy (New York, Frick Collection). In these works Bellini continued to give formal expression to the relationship between man and nature, filling the rational space of the Tuscans with the infinite variety of the Italian landscape and the entire range of human feeling (for instance, that of maternity in his many studies of the Madonna and Child). Furthermore, each detail has its part to play in the overall arrangement of space. In Lamentation over the Body of Christ (c.1485-1500, Uffizi, Florence) Bellini first deploys ideas that he was to elaborate in a group of works painted a little later. The picture has been described as, on the one hand "a strictly measured perspective painting", with bold planes inspired by Antonello and, on the other, as "an enlarged space, no longer empty but enriched with an atmosphere that sweetens the relationships between the volumes". The perfectly calculated distribution of space in the Frari Triptych (1488, Santa Maria Gloriosa dei Frari, Venice) reveals the influence of its abstraction and the geometric rigour of its volumes; at the same time, in The Transfiguration (c.1480-5, Capodimonte Museum, Naples), a new luminosity fills the composition and softens the outlines of the planes. In the closed universe of the San Giobbe Altarpiece (1487, Venice Academy Gallery) the light, full of shadows and golden reflections from the mosaics, envelops the volumes and humanizes everything that Bellini took from Antonello. Bellini's search for a more regular, more solemn and monumental space was accompanied by an attempt to achieve greater pictorial effects, and his works of this period - see, for instance, the Barbarigo Altarpiece (1488, San Pietro Martire, Murano) - prefigure the tendencies of the 16th century. The series of paintings of the Madonna and Child, dating from around 1490, shows a striking mastery of Renaissance space and an apparently inexhaustible inventiveness comparable to that of the early portraits of Titian. From his various stays in the Veneto, Romagna and the Marches, Bellini brought back a vision of medieval walled towns, encircled by fertile hills, and of rivers spanned by ancient bridges - a vision that offers the most profound insight into the Italian landscape. In it one can follow the course of the past, with campaniles from Ravenna found side by side with Roman campaniles and Gothic towers. It is a historical landscape based entirely upon the natural landscape, in which nature itself, like those hills arranged by the hand of man, takes on a meaning that is also historical. The bright colours and the detail, stemming from Piero della Francesca, are less the outcome of a quest for realism than a very lively awareness of the world. The spatial volumes appear to be produced naturally from the play of light, while the rigorous perspective plan is concealed by the free orchestration of tones. Although extremely busy during the 1480s, 1490s and 1500s, most of this output has not survived. In 1507 Gentile Bellini (Giovanni's brother) died, and bequeathed their father Jacopo's substantial book of designs to Giovanni, on condition that he completed Gentile's unfinished picture St Mark Preaching in Alexandria (1505, Pinacoteca di Brera, Milan). This condition was duly met. The works of Giovanni Bellini's last years - Madonna and Child Blessing (1510, Pinacoteca di Brera); the S. Giovanni Crisostomo Altarpiece (1513, Church of S. Giovanni Crisotomo) are stamped with the monumentality and the pictorial qualities of the works of his young contemporaries, Giorgione and Titian. Bellini, who was one of the originators of the new style, adapted himself perfectly to it - see: Woman with a Mirror (1515, Kunsthistorisches Museum, Vienna). His classicism made no distinction between the sacred and the profane and was not affected by the new taste for classical or secular subjects. Rather, these themes allowed him to counter the too systematic classicism of the new generation. From his Drunkennes of Noah (c.1515-16, Besancon Museum) there emerges a profoundly youthful attachment to life, an abandonment to existence, the strawberry-red of the drapery, the living, gilded flesh of Noah as he lies sprawled out on his back, the tender green of the grass, the cup touched by the dusty light, are set against a background of vines and autumnal foilage. His classicism remains the same in this provocative, naturalistic affirmation, which only in his old age developed its uncompromising character. There are few other examples of such an evolution as Bellini's - of an artist who took Venetian painting from the lifelessness of the end of the Gothic era to the threshold of modern painting. Bellini remained busy to the very end. 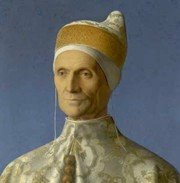 He continued to be deluged with commissions well into his 70s, and was still heavily involved in supervising the paintings in the Hall of the Great Council in the Doge's palace. In 1514 he agreed to paint The Feast of the Gods for the Duke Alfonso I of Ferrara, but died in 1516. During his life, he was recognized as the leading painter of his period, being described by the great German painter and printmaker Albrecht Durer (1471-1528), during his 1506 visit to Venice, as "the best painter of them all." The Renaissance biographer Giorgio Vasari was equally convinced of Giovanni Bellini's greatness. For later members of the Venetian School, see also biographies of Jacopo Tintoretto (1518-1594) and Paolo Veronese (1528-1588). Paintings by Giovanni Bellini can be seen in many of the best art museums throughout the world. Here is a short selection of his most important works. See: Diptych (2-panel picture); Triptych (3-panel picture); Polyptych (multi).  For more biographical details about famous Venetian Renaissance painters, see: Homepage.